Made from scratch is something that you don’t often hear these days. But when we think of something made from scratch we think of home, something delicious and a cut above what you find pre-made in the grocery store. Made from scratch bread conjures up wafting bakery smells that make our stomachs growl and our mouths water. But where can you get fresh baked, authentic pita bread that is not pre-packaged, frozen and shipped across the country? Where can you find pita bread rich in flavor and just the right texture without the preservatives? 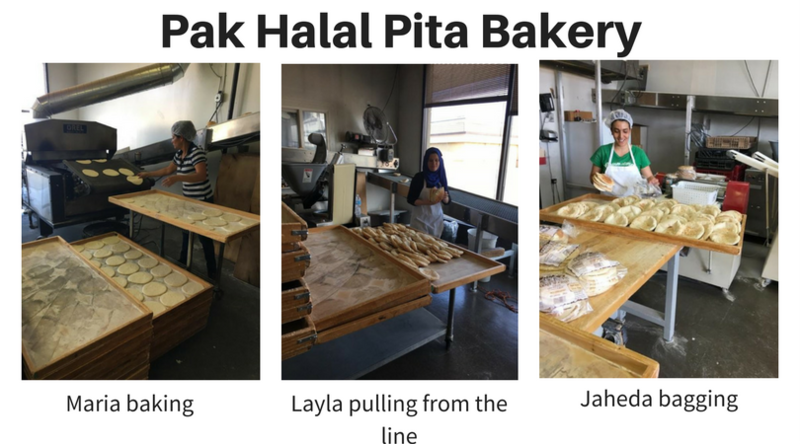 Local Kansas City residents can find it conveniently located in Lenexa at Pak Halal International Foods. Pak Halal features freshly baked pita and other Mediterranean bread options. Six days a week, the bakery opens at 4:30 am. The very dedicated women that work in Pak Halal’s bakery take pride in making fresh breads. The process is long with many steps but well worth the time and effort. It is a process that has been passed down through generations. Authentic pita bread right out of the oven is a treat you must try. In conjunction with the new Middle Eastern restaurant Rumman Mediterranean Cuisine, Pak Halal has some exciting pita news. Not only will their fresh baked pita be featured on the menu, but a new size pita offering is now available at Pak Halal. Mini pocket pitas are now available for purchase. The breads are 4” in diameter and there are 15 in a bag. They are sprinkled with sesame and black seeds. This new size is perfect for lunches, snacks and catered events. Pak Halal always recommends you use their pita immediately upon purchase or freeze for preserved freshness. Of course, special bread ordering is always available at Pak Halal. Call (913) 599-0700 to discuss your bread needs. Made from scratch pita bread is just better. And now you can pick some up at Pak Halal for any occasion. Newer PostWhat exactly is Halal Meat?